Council Directive 91/439/EEC of 29 July 1991 on driving licences ( 3 ) has been significantly amended on several occasions. Now that new amendments are being made to the said Directive, it is desirable, in order to clarify matters, that the provisions in question should be recast. The measures necessary for the implementation of this Directive should be adopted in accordance with Council Decision 1999/468/EC of 28 June 1999 laying down the procedures for the exercise of implementing powers conferred on the Commission ( 4 ). — The minimum age for category A is fixed at 20 years. However, access to the driving of motorcycles of this category shall be subject to a minimum of two years' experience on motorcycles under an A2 licence. This requirement as to previous experience may be waived if the candidate is at least 24 years old. — The minimum age for motor tricycles exceeding 15 kW is fixed at 21 years. — a test of skills and behaviour has been passed. (d) for categories B and BE down to 17 years. (b) vehicles undergoing road tests for repair or maintenance purposes. (b) licences for categories BE, C1E, CE, D1E and DE shall be issued only to drivers already entitled to drive vehicles in categories B, C1, C, D1 and D respectively. 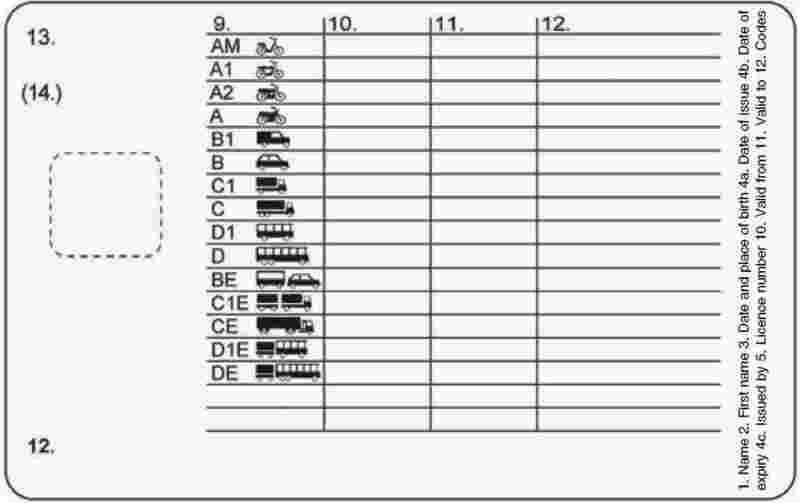 (f) licences granted for categories A, B, C or D shall be valid for categories A1, A2, B1, C1, or D1 respectively. (b) category A1 motorcycles under a licence for category B. (b) vehicles of a maximum authorised mass exceeding 3 500 kg by holders over 21 years old of a driving licence for category B which was obtained at least two years before, provided that the main purpose of the vehicles is to be used only when stationary as an instructional or recreational area, and that they are being used by non-commercial bodies for social purposes and that vehicles have been modified so that they may not be used either for the transport of more than nine persons or for the transport of any goods other than those strictly necessary for their purposes. (b) who have passed a theory test only as regards category AM; Member States may require applicants to pass a test of skills and behaviour and a medical examination for this category. (e) who have their normal residence in the territory of the Member State issuing the licence, or can produce evidence that they have been studying there for at least six months. (a) As from 19 January 2013, licences issued by Member States for categories AM, A1, A2, A, B, B1 and BE shall have an administrative validity of 10 years. (d) The presence of a microchip pursuant to Article 1 shall not be a prerequisite for the validity of a driving licence. The loss or unreadability of the microchip, or any other damage thereto, shall not affect the validity of the document. (b) normal residence in the territory of the Member State issuing the licence, or evidence that applicants have been studying there for at least six months. (d) In order to facilitate the checks pursuant to point (b), Member States shall use the EU driving licence network once it is operational. 1. The physical characteristics of the card of the ►M2 European Union model driving licence ◄ shall be in accordance with ISO 7810 and ISO 7816-1. — in the area of the photograph the security design background and photograph should overlap on at least its border (weakening pattern). — tactile characters, symbols or patterns*. (c) Member States are free to introduce additional security features. As a basis, the techniques indicated with an asterisk are to be preferred as they enable the law enforcement officers to check the validity of the card without any special means. 3. The licence shall have two sides. (c) a space shall be reserved on the ►M2 European Union model driving licence ◄ to allow for the possible introduction of a microchip or similar computer device. (b) After consulting the Commission, Member States may add colours or markings, such as bar codes and national symbols, without prejudice to the other provisions of this Annex. (c) Information contained in the front and reverse side of the card shall be legible with the eye, using a minimum character height of 5 points for items 9 to 12 on the reverse side. — a test of skills and behaviour. 4.1.10. The driver's responsibility in respect to the carriage of passengers; comfort and safety of passengers; transport of children; necessary checks before driving away; all sorts of buses should be part of the theory test (public service buses and coaches, buses with special dimensions, …) (categories D, DE, D1, D1E only). 4.1a. Member States may exempt applicants to a licence for a category C1 or C1E vehicle outside the scope of Regulation (EEC) No 3821/85 from demonstrating their knowledge of the subjects listed in points 4.1.1 to 4.1.3. 4.2.8. The driver's responsibility in respect of the receipt, carriage and delivery of goods in accordance with the agreed conditions (categories C, CE only). ‘Vehicle with manual transmission’ means a vehicle in which a clutch pedal (or lever operated manually for categories A, A2 and A1) is present and must be operated by the driver when starting or stopping the vehicle and changing gears. Vehicles that do not meet the criteria laid down in point 5.1.1 shall be considered to have automatic transmission. 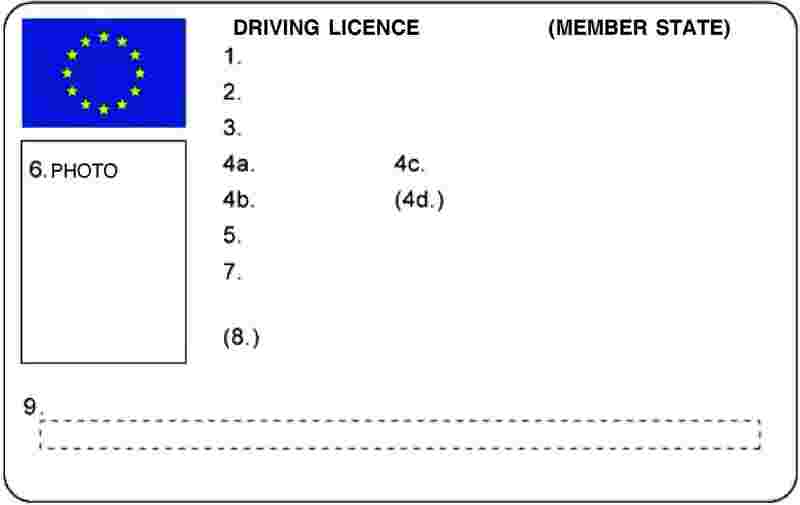 Member States may decide that no restriction to vehicles with automatic transmission shall be recorded on the driving licence for a category C, CE, D or DE vehicle referred to in point 5.1.2, when the applicant already holds a driving licence obtained on a vehicle with manual transmission in at least one of the following categories: B, BE, C, CE, C1, C1E, D, DE, D1 or D1E, and has performed the actions described in point 8.4 during the test of skills and behaviour. 5.2. The vehicles used in tests of skills and behaviour shall comply with the minimum criteria given below. Member States may make provisions for more stringent criteria or add others. Member States may apply to vehicles of category A1, A2 and A, used in the test of skills and behaviour, a tolerance of 5 cm3 below the required minimum cylinder capacity. If the motorcycle is powered by an electric motor, the power to weight ratio of the vehicle shall be at least 0,25 kW/kg. Testing vehicles for categories BE, C, CE, C1, C1E, D, DE, D1 and D1E which are not in conformity with the minimum criteria given above but which were in use on or before the moment of entry into force of this Directive, may still be used for a period not exceeding ten years after that date. The requirements related to the load to be carried by these vehicles, may be implemented by Member States up to ten years from the moment of entry into force of Commission Directive 2000/56/EC ( 9 ). 6.2.5. Braking: at least two braking exercises shall be executed, including an emergency brake at a minimum speed of 50 km/h; this should allow competence to be assessed in handling of the front and rear brake, vision direction and the position on the motorcycle. 7.1.6. Checking the coupling mechanism and the brake and electrical connections (category BE only). 8.2.4. Parking to let passengers on or off the bus safely (categories D, DE, D1, D1E only). 8.4.1. Driving in such a way as to ensure safety and to reduce fuel consumption and emissions during acceleration, deceleration, uphill and downhill driving, when necessary by selecting gears manually. 9.2. During their assessment, driving examiners shall pay special attention to whether an applicant is showing a defensive and social driving behaviour. This should reflect the overall style of driving and the driving examiner should take this into account in the overall picture of the applicant. It includes adapted and determined (safe) driving, taking into account road and weather conditions, taking into account other traffic, taking into account the interests of other road users (particularly the more vulnerable) and anticipation. 9.3.10. Braking and stopping: decelerating in time, braking or stopping according to circumstances; anticipation; using the various braking systems (only for categories C, CE, D, DE); using speed reduction systems other than the brakes (only for categories C, CE, D, DE). — Help ensure the safety of all road users, and in particular of the weakest and most exposed by showing due respect for others. 1.3. National legislation may provide for the provisions set out in this Annex for Group 2 drivers to apply to drivers of Category B vehicles using their driving licence for professional purposes (taxis, ambulances, etc.). 2. Similarly, applicants for a first driving licence or for the renewal of a driving licence are classified in the group to which they will belong once the licence has been issued or renewed. 5. The standards set by Member States for the issue or any subsequent renewal of driving licences may be stricter than those set out in this Annex. 6. All applicants for a driving licence shall undergo an appropriate investigation to ensure that they have adequate visual acuity for driving power-driven vehicles. Where there is reason to doubt that the applicant’s vision is adequate, he/she shall be examined by a competent medical authority. At this examination attention shall be paid, in particular, to the following: visual acuity, field of vision, twilight vision, glare and contrast sensitivity, diplopia and other visual functions that can compromise safe driving. For group 1 drivers, licensing may be considered in ‘exceptional cases’ where the visual field standard or visual acuity standard cannot be met; in such cases the driver should undergo examination by a competent medical authority to demonstrate that there is no other impairment of visual function, including glare, contrast sensitivity and twilight vision. The driver or applicant should also be subject to a positive practical test conducted by a competent authority. 6.1. Applicants for a driving licence or for the renewal of such a licence shall have a binocular visual acuity, with corrective lenses if necessary, of at least 0,5 when using both eyes together. 6.2. Applicants for a driving licence, or for the renewal of such a licence, who have total functional loss of vision in one eye or who use only one eye (e.g. in the case of diplopia) must have a visual acuity of at least 0,5, with corrective lenses if necessary. The competent medical authority must certify that this condition of monocular vision has existed for a sufficiently long time to allow adaptation and that the field of vision in this eye meets the requirement laid down in paragraph 6.1. 6.3. After any recently developed diplopia or after the loss of vision in one eye, there should be an appropriate adaptation period (for example, six months), during which driving is not allowed. After this period, driving is only allowed following a favourable opinion from vision and driving experts. 6.4. Applicants for a driving licence or for the renewal of such a licence shall have a visual acuity, with corrective lenses if necessary, of at least 0,8 in the better eye and at least 0,1 in the worse eye. If corrective lenses are used to attain the values of 0,8 and 0,1, the minimum acuity (0,8 and 0,1) must be achieved either by correction by means of glasses with a power not exceeding plus eight dioptres, or with the aid of contact lenses. The correction must be well tolerated. After a substantial loss of vision in one eye, there should be an appropriate adaptation period (for example six months) during which the subject is not allowed to drive. After this period, driving is only allowed after a favourable opinion from vision and driving experts. 7. Driving licences may be issued to or renewed for applicants or drivers in Group 2 subject to the opinion of the competent medical authorities; particular account will be taken in medical examinations of the scope for compensation. 8. Driving licences shall not be issued to or renewed for applicants or drivers suffering from complaints or abnormalities of the locomotor system which make it dangerous to drive a power-driven vehicle. 8.1. Driving licences subject to certain restrictions, if necessary, may be issued to physically disabled applicants or drivers following the issuing of an opinion by a competent medical authority. This opinion must be based on a medical assessment of the complaint or abnormality in question and, where necessary, on a practical test. It must also indicate what type of modification to the vehicle is required and whether the driver needs to be fitted with an orthopaedic device, insofar as the test of skills and behaviour demonstrates that with such a device driving would not to be dangerous. 8.2. Driving licences may be issued to or renewed for any applicant suffering from a progressive complaint on condition that the disabled person is regularly examined to check that the person is still capable of driving the vehicle completely safely. 8.3. The competent medical authority shall give due consideration to the additional risks and dangers involved in the driving of vehicles covered by the definition of this group. 9. Any disease capable of exposing an applicant for a first licence or a driver applying for renewal to a sudden failure of the cardiovascular system such that there is a sudden impairment of the cerebral functions constitutes a danger to road safety. 9.1. Driving licences will not to be issued to, or renewed for, applicants or drivers with serious arrhythmia. 9.2. Driving licences may be issued to, or renewed for, applicants or drivers wearing a pacemaker subject to authorised medical opinion and regular medical check-ups. 9.3. The question of whether to issue or renew a licence for applicants or drivers suffering from abnormal arterial blood pressure shall be assessed with reference to the other results of the examination, any associated complications and the danger they might constitute for road safety. 9.4. Generally speaking, a driving licence shall not be issued to or renewed for applicants or drivers suffering from angina during rest or emotion. The issuing or renewal of a driving licence to any applicant or driver having suffered myocardial infarction shall be subject to authorised medical opinion and, if necessary, regular medical check-ups. 9.5. The competent medical authority shall give due consideration to the additional risks and dangers involved in the driving of vehicles covered by the definition of this group. 10. In the following paragraphs, a severe hypoglycaemia means that the assistance of another person is needed and a recurrent hypoglycaemia is defined as a second severe hypoglycaemia during a period of 12 months. 10.1. Driving licences may be issued to, or renewed for, applicants or drivers who have diabetes mellitus. When treated with medication, they should be subject to authorised medical opinion and regular medical review, appropriate to each case, but the interval should not exceed five years. 10.2. Driving licences shall not be issued to, nor renewed for, applicants or drivers who have recurrent severe hypoglycaemia or/and impaired awareness of hypoglycaemia. A driver with diabetes should demonstrate an understanding of the risk of hypoglycaemia and adequate control of the condition. — there are no other debarring complications of diabetes. 10.4. A severe hypoglycaemic event during waking hours, even unrelated to driving, should be reported and should give rise to a reassessment of the licensing status. 11.1. Driving licences shall not be issued to, or renewed for, applicants or drivers suffering from a serious neurological disease, unless the application is supported by authorised medical opinion. 11.2. In the following paragraphs, a moderate obstructive sleep apnoea syndrome corresponds to a number of apnoeas and hypopnoeas per hour (Apnoea-Hypopnoea Index) between 15 and 29 and a severe obstructive sleep apnoea syndrome corresponds to an Apnoea-Hypopnoea Index of 30 or more, both associated with excessive daytime sleepiness. 11.3. Applicants or drivers in whom a moderate or severe obstructive sleep apnoea syndrome is suspected shall be referred for further authorised medical advice before a driving licence is issued or renewed. They may be advised not to drive until confirmation of the diagnosis. 11.4. Driving licences may be issued to applicants or drivers with moderate or severe obstructive sleep apnoea syndrome who show adequate control of their condition and compliance with appropriate treatment and improvement of sleepiness, if any, confirmed by authorised medical opinion. 11.5. Applicants or drivers with moderate or severe obstructive sleep apnoea syndrome under treatment shall be subject to a periodic medical review, at intervals not exceeding three years for drivers of group 1 and one year for drivers of group 2, with a view to establish the level of compliance with the treatment, the need for continuing the treatment and continued good vigilance. 12. Epileptic seizures or other sudden disturbances of the state of consciousness constitute a serious danger to road safety if they occur in a person driving a power-driven vehicle. 12.1. Drivers assessed under group 1 with epilepsy should be under licence review until they have been seizure-free for at least five years. 12.2. Provoked epileptic seizure: the applicant who has had a provoked epileptic seizure because of a recognisable provoking factor that is unlikely to recur at the wheel can be declared able to drive on an individual basis, subject to neurological opinion (the assessment should be, if appropriate, in accordance with other relevant sections of Annex III (e.g. in the case of alcohol or other co-morbidity). 12.3. First or single unprovoked seizure: the applicant who has had a first unprovoked epileptic seizure can be declared able to drive after a period of six months without seizures, if there has been an appropriate medical assessment. National authorities may allow drivers with recognised good prognostic indicators to drive sooner. 12.4. Other loss of consciousness: the loss of consciousness should be assessed according to the risk of recurrence while driving. 12.5. Epilepsy: drivers or applicants can be declared fit to drive after a one-year period free of further seizures. 12.6. Seizures exclusively in sleep: the applicant or driver who has never had any seizures other than seizures during sleep can be declared fit to drive so long as this pattern has been established for a period which must not be less than the seizure-free period required for epilepsy. If there is an occurrence of attacks/seizure arising while awake, a one-year period free of further event before licensing is required (see ‘Epilepsy’). 12.7. Seizures without influence on consciousness or the ability to act: the applicant or driver who has never had any seizures other than seizures which have been demonstrated exclusively to affect neither consciousness nor cause any functional impairment can be declared fit to drive so long as this pattern has been established for a period which must not be less than the seizure-free period required for epilepsy. If there is an occurrence of any other kind of attacks/seizures a one-year period free of further event before licensing is required (see ‘Epilepsy’). 12.8. Seizures because of a physician-directed change or reduction of anti-epileptic therapy: the patient may be advised not to drive from the commencement of the period of withdrawal and thereafter for a period of six months after cessation of treatment. Seizures occurring during physician-advised change or withdrawal of medication require three months off driving if the previously effective treatment is reinstated. 12.9. After curative epilepsy surgery: see ‘Epilepsy’. 12.10. The applicant should be without anti-epileptic medication for the required period of seizure freedom. An appropriate medical follow-up has been done. On extensive neurological investigation, no relevant cerebral pathology was established and there is no epileptiform activity on the electroencephalogram (EEG). An EEG and an appropriate neurological assessment should be performed after the acute episode. 12.11. Provoked epileptic seizure: the applicant who has had a provoked epileptic seizure because of a recognisable provoking factor that is unlikely to recur at the wheel can be declared able to drive on an individual basis, subject to neurological opinion. An EEG and an appropriate neurological assessment should be performed after the acute episode. 12.12. First or single unprovoked seizure: the applicant who has had a first unprovoked epileptic seizure can be declared able to drive once five years’ freedom from further seizures has been achieved without the aid of anti-epileptic drugs, if there has been an appropriate neurological assessment. National authorities may allow drivers with recognised good prognostic indicators to drive sooner. 12.13. Other loss of consciousness: the loss of consciousness should be assessed according to the risk of recurrence while driving. The risk of recurrence should be 2 % per annum or less. 12.14. Epilepsy: 10 years freedom from further seizures shall have been achieved without the aid of anti-epileptic drugs. National authorities may allow drivers with recognised good prognostic indicators to drive sooner. This also applies in case of ‘juvenile epilepsy’. Certain disorders (e.g. arterio-venous malformation or intra-cerebral haemorrhage) entail an increased risk of seizures, even if seizures have not yet occurred. In such a situation an assessment should be carried out by a competent medical authority; the risk of having a seizure should be 2 % per annum or less to allow licensing. 13.2. The competent medical authority shall give due consideration to the additional risks and dangers involved in the driving of vehicles covered by the definition of this group. 14. Alcohol consumption constitutes a major danger to road safety. In view of the scale of the problem, the medical profession must be very vigilant. 14.1. Driving licences shall not be issued to, or renewed for, applicants or drivers who are dependent on alcohol or unable to refrain from drinking and driving. 14.2. The competent medical authority shall give due consideration to the additional risks and dangers involved in the driving of vehicles covered by the definition of this group. 15.1. Driving licences shall not be issued to, or renewed for, applicants or drivers who regularly use psychotropic substances, in whatever form, which can hamper the ability to drive safely where the quantities absorbed are such as to have an adverse effect on driving. This shall apply to all other medicinal products or combinations of medicinal products which affect the ability to drive. 15.2. The competent medical authority shall give due consideration to the additional risks and dangers involved in the driving of vehicles covered by the definitions of this group. 16.1. Driving licences may be issued or renewed for applicants and drivers suffering from serious renal insufficiency subject to authorised medical opinion and regular medical check-ups. 16.2. Save in exceptional cases duly justified by authorised medical opinion, and subject to regular medical check-ups, driving licences shall not be issued to or renewed for applicants or drivers suffering from serious and irreversible renal deficiency. 17.1. Subject to authorised medical opinion and, if necessary, regular medical check-ups, driving licences may be issued to or renewed for applications or drivers who have had an organ transplant or an artificial implant which affects the ability to drive. 17.2. The competent medical authority shall give due consideration to the additional risks and dangers involved in the driving of vehicles covered by the definition of this group. 18. As a general rule, where applicants or drivers suffer from any disorder which is not mentioned in the preceding paragraph but is liable to be, or to result in, a functional incapacity affecting safety at the wheel, driving licences shall not be issued or renewed unless the application is supported by authorised medical opinion and, if necessary, subject to regular medical check-ups. 1.1. A person authorised to conduct practical assessments in a motor vehicle of the driving performance of a candidate must have knowledge, skills and understanding related to the topics listed in points 1.2 to 1.6. 1.2. The competences of an examiner must be relevant to assessing the performance of a candidate seeking the category of driving licence entitlement for which the driving test is being undertaken. — provide timely and constructive feedback. — A person authorised to conduct a practical test for a category of driving licence must be able to drive to a consistently high standard that type of motor vehicle. — treat candidates with respect and indiscriminately. — knowledge about vehicle physics such as speed, friction, dynamics, energy. 1.8. Driving in a fuel efficient and environmentally friendly way. (e) may not be active as a commercial driving instructor in a driving school simultaneously. 2.3.1. Member States may authorise an examiner to conduct driving tests for categories AM, A1, A2 and A upon passing the initial qualification prescribed in point 3 for one of these categories. 2.3.2. Member States may authorise an examiner to conduct driving tests for categories C1, C, D1 and D upon passing the initial qualification prescribed in point 3 for one of these categories. 2.3.3. Member States may authorise an examiner to conduct driving tests for categories BE, C1E, CE, D1E and DE upon passing the initial qualification prescribed in point 3 for one of these categories. 3.1.1. Before a person may be authorised to conduct driving tests, that person must satisfactorily complete such training programme as a Member State may specify in order to have the competences set out in point 1. 3.1.2. Member States must determine whether the content of any particular training programme will relate to authorisation to conduct driving tests for one driving licence category, or more than one. 3.2.1. Before a person may be authorised to conduct driving tests, that person must demonstrate a satisfactory standard of knowledge, understanding, skills and aptitude in respect of the subjects listed in point 1. 3.2.2. Member States shall operate an examination process that assesses, in a pedagogically appropriate manner, the competences of the person as defined under point 1, in particular point 1.4. The examination process must include both a theoretical element and a practical element. Computer-based assessment may be used where appropriate. The details concerning the nature and duration of any tests and assessments within the examination shall be at the discretion of the individual Member States. 3.2.3. Member States must determine whether the content of any particular examination will relate to authorisation to conduct driving tests for one driving licence category, or more than one. 4.1.1. Member States shall have in place quality assurance arrangements to provide for the maintenance of standards of driving examiners. 4.1.2. Quality assurance arrangements should involve the supervision of examiners at work, their further training and re-accreditation, their continuing professional development, and by periodic review of the outcomes of the driving tests that they have conducted. 4.1.3. Member States must provide that each examiner is subject to yearly supervision making use of quality assurance arrangements listed in point 4.1.2. Moreover, the Member States must provide that each examiner is observed conducting tests once every 5 years, for a minimum period cumulatively of at least half a day, allowing the observation of several tests. When issues are identified corrective action should be put in place. The person undertaking the supervision must be a person authorised by the Member State for that purpose. 4.1.4 Member States may provide that where an examiner is authorised to conduct driving tests in more than one category, satisfying the supervision requirement in relation to tests for one category satisfies the requirement for more than one category. 4.1.5 The work of driving examination must be monitored and supervised by a body authorised by the Member State, to ensure correct and consistent application of assessment. — in order to develop and maintain the necessary practical driving skills. 4.2.2. Member States shall take the appropriate measures for ensuring that specific training is given promptly to those examiners that have found to be seriously malfunctioning by the quality assurance system in place. 4.2.3. The nature of periodic training may take the form of briefing, classroom training, conventional or electronic-based learning, and it may be undertaken on an individual or group basis. It may include such re-accreditation of standards as Member States consider appropriate. 4.2.4. Member States may provide that where an examiner is authorised to conduct driving tests in more than one category, satisfying the periodic training requirement in relation to tests for one category satisfies the requirement for more than one category, provided the condition set out in point 4.2.5 is satisfied. 4.2.5. Where an examiner has not conducted tests for a category within a 24-month period, the examiner shall undertake a suitable reassessment before being allowed to carry out driving tests relating to that category. That re-assessment may be undertaken as part of the requirement set out in point 4.2.1. 5.1. Member States may allow persons authorised to conduct driving tests immediately before these provisions come into force to continue to conduct driving tests, notwithstanding that they were not authorised in accordance with the general conditions in point 2 or the initial qualification process set out in point 3. 5.2. Such examiners are nonetheless subject to the regular supervision and quality assurance arrangements set out in point 4. — organise the test of skills and behaviour provided for in Article 7(1)(d). — at least 7 hours. — Vehicle combinations used for the training shall fall within the category of driving licence participants have applied for. — organise the test of skills and behaviour provided for in Article 7(1)(c). — The driver training shall contain all aspects covered in point 6 of Annex II. — Each participant has to perform the practical components of the training and shall demonstrate its skills and behaviour on public roads. — Motorcycles used for the training shall fall within the category of driving licence participants have applied for. ( 1 ) OJ C 112, 30.4.2004, p. 34. ( 2 ) Opinion of the European Parliament of 23 February 2005 (OJ C 304 E, 1.12.2005, p. 202), Council Common Position of 18 September 2006 (OJ C 295 E, 5.12.2006, p. 1) and Position of the European Parliament of 14 December 2006 (not yet published in the Official Journal). Council Decision of 19 December 2006. ( 3 ) OJ L 237, 24.8.1991, p. 1. Directive as last amended by Regulation (EC) No 1882/2003 of the European Parliament and of the Council (OJ L 284, 31.10.2003, p. 1). ( 4 ) OJ L 184, 17.7.1999, p. 23. Decision as amended by Decision 2006/512/EC (OJ L 200, 22.7.2006, p. 11). ( 5 ) OJ L 124, 9.5.2002, p. 1. Directive as last amended by Commission Directive 2005/30/EC (OJ L 106, 27.4.2005, p. 17). ( 6 ) OJ L 226, 10.9.2003, p. 4. Directive as amended by Council Directive 2004/66/EC (OJ L 168, 1.5.2004, p. 35). ( 7 ) OJ L 370, 31.12.1985, p. 8. ( 8 ) OJ L 102, 11.4.2006, p. 1. ( 9 ) Commission Directive 2000/56/EC of 14 September 2000 amending Council Directive 91/439/EEC on driving licences (OJ L 237, 21.9.2000, p. 45). ( 10 ) OJ L 199, 31.7.1985, p. 56.